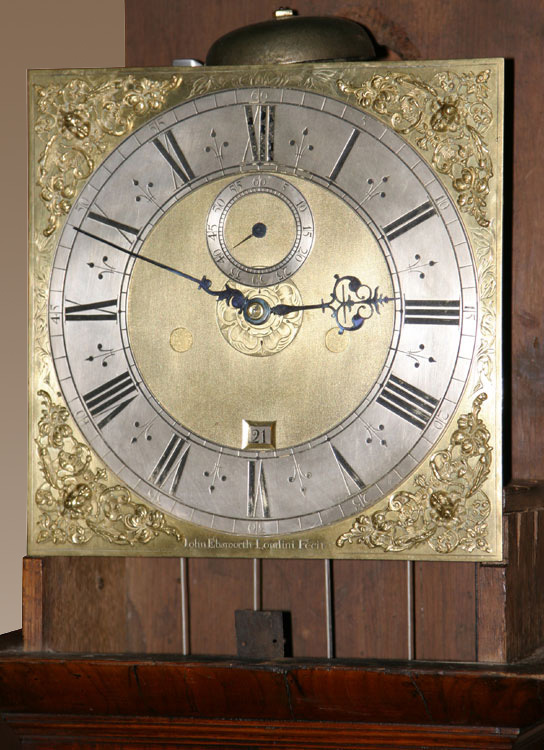 A James II, 'bird & flower' marquetry longcase with 11" square brass dial and month-going large plated movement with 6 knopped and finned pillars, fully latched. The finely matted 11" dial with Tudor rose at centre, floral engraving between spandrels and signature "John Ebsworth Londini Fecit". Silvered Roman chapter ring with inner quarter-hour track and half-hour markers, outer track with Arabic five minutes. Silvered seconds ring and calendar aperture. Very fine and decorative hour and minute hands. 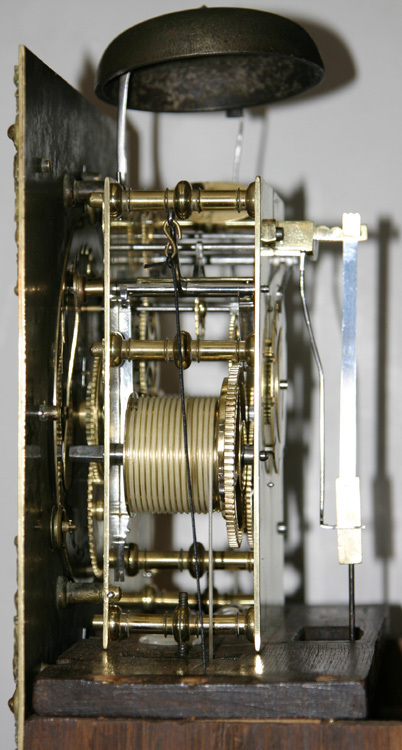 The month duration large plated movement with 6 knopped and finned pillars, fully latched, having been fully serviced, strikes the hours on a bell via an outside countwheel. 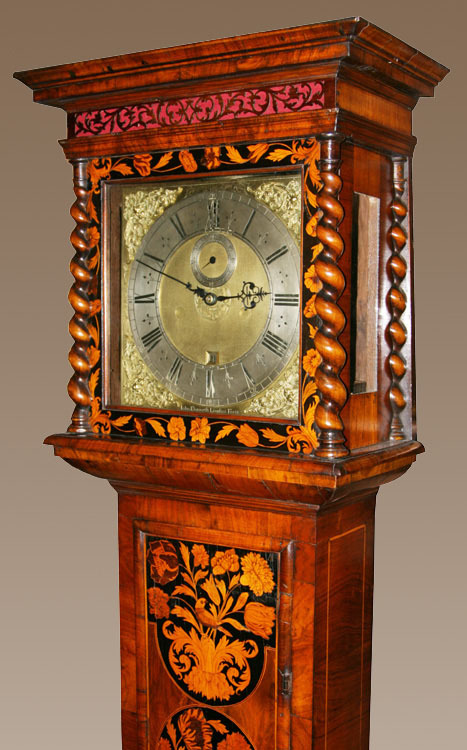 High quality arbors and very fine pinions, typical of London clocks of this period. Early scape wheel and anchor enhance this movement. Bolt and shutter maintaining power. 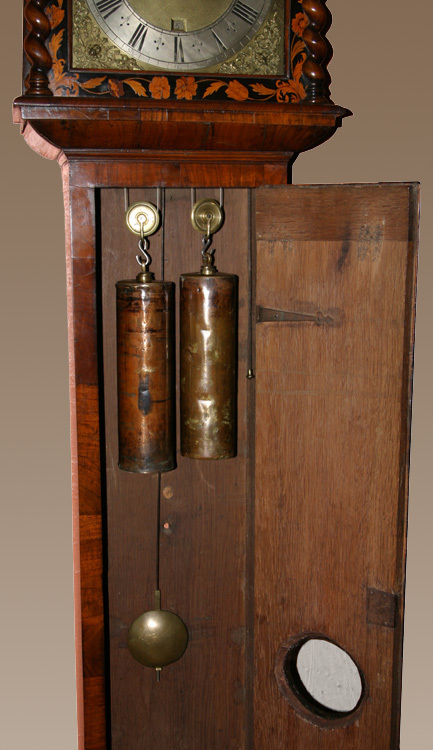 Early, deep, double brass-faced pendulum. The marquetry case having good long 42" trunk door with glass lenticle, the sides in walnut with fine stringing detail, the base sitting on bun feet. The flat-topped hood with fret, glazed side panels and barley twist columns. This clock has all of the features you would expect on a high quality London clock. John Ebsworth was apprenticed in February 1657 to Richard Ames and made a Freeman in April 1665. He was Master of the Clockmakers' Company in 1697 and died in 1699.